Today is May Day – a day celebrated around the world commemorating the achievements of working people and the labor movement. In the Oregon Legislature, we are wrapping up an eventful week of progress on our agenda to strengthen the rights of workers in our state. Near the top of the agenda is raising the minimum wage in Oregon. As it stands, a single parent working full time at a minimum wage job lives below the poverty line and is often eligible for public assistance. That’s just wrong. Working moms in my district want nothing more than to support their kids and show them the value of work. I’m fighting for a higher minimum wage so that I can look these moms in the eye at the end of this session and tell them we got it done – that they will have the tools to provide for their families. 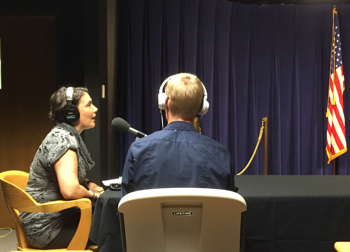 This week I was interviewed on OPB’s Think Out Loud on the fight to raise the minimum wage (that’s me in studio). Listen to the interview and share! I’m also fighting to ban the box you see on many job applications asking if you’ve ever been convicted of a crime. Why? Because it erects an enormous and unnecessary barrier to Oregonians – disproportionally Oregonians of color – who have served their time and are trying to get back on their feet. Our bill won’t prevent employers from doing criminal background checks, and it keeps in place laws barring people with certain convictions from working in particular occupations, such as childcare. What it will do is give thousands of Oregonians a better shot at getting a job, getting ahead, and supporting their families after serving their debt to society. Our bill passed in the House on Wednesday, and is now under consideration in the Senate. We’re also making progress on my bill requiring health insurance companies to reimburse women for a full 12-month prescription for birth control. Right now, many insurers only reimburse for 30 or 90 days at a time, which requires working women to make unnecessary trips to the pharmacy – increasing the likelihood of unwanted pregnancies. My bill passed the House yesterday with overwhelming bipartisan support, and will now be considered in the Senate. Raising the minimum wage, banning the box, and making it easier for women to exercise their reproductive freedom – these proposals will make a difference for working families in Oregon. Thank you for standing with me on this May Day! Posted on May 1, 2015.